I begin again this topic. Linda, JKP please restore up their posts. All owners of the Latin language. Please tell me in the labels Quire is used Latin abbreviations? The last character "q" - this abbreviation Quire? Why in the designation Quire19, Quire20 no reduction? So it was decided? Nick wrote. (in the end of this post) You are not allowed to view links. Register or Login to view. I think that the absence of reductions in labels Quire19, Quire 20 could be an argument for fact that label Quire 19, Quire 20, written simultaneously, but later than other labels Quire of 1-17, in already stitch up the manuscript. So the labels found themselves opposite each other. (27-01-2017, 07:53 AM)Wladimir D Wrote: You are not allowed to view links. Register or Login to view. I begin again this topic. Linda, JKP please restore up their posts. No, the last character "q" does not stand for quire. It's not a "q", it's a 9 character that stands for the Latin abbreviation "-us" or "-um" (and sometimes other endings, depending on context). So, if you see the number 2 and it is followed by "9", it means "secondus" (2nd). Thus, 19 primus (1st), 29 secondus (2nd), 39 tertius (3rd), etc. I can prove (without the use of chemical analysis of the ink), that label the Q20 written later than tags Q1-17, of page numbering and column of numbers on f49v. The numbers "2" and "0" is approximately 5/8 of the height of the other digits. Have not sustained proportions of numbers "1" and "2" in labels Q19 and Q20, and numbers found themselves of different heights in Q20. My post supports the abbreviated "us" ending and showed a list of pope reign dates that not only share the exact use of "pm9" (primus) (#6 & #8 below) meaning "first", but shows some other similarities with the text, namely "cc" and "40". I was postulating that "m9" represents medius, meaning middle, "t9" terminus, meaning end, and "89" maybe penultimate? (27-01-2017, 04:10 PM)Linda Wrote: You are not allowed to view links. Register or Login to view. My post supports the abbreviated "us" ending and showed a list of pope reign dates that not only share the exact use of "pm9" (primus) (#6 & #8 below) meaning "first", but shows some other similarities with the text, namely "cc" and "40". I was postulating that "m9" represents medius, meaning middle, "t9" terminus, meaning end, and "89" maybe penultimate? The cc and 4o are also consistent with 15th-century Latin abbreviations, as is usqz (usquibus). The cc ligature had various meanings (again, depending on context), including cc, cr, ci, tc, tr, etc. Sometimes you can't tell which one it is without reading the rest of the word (and sometimes the rest of the words around it—the shape doesn't always tell you exactly which letters they are (or whether they are numbers rather than letters). In medieval Latin, interpretation is based on context. The 4o was often used as an abbreviation for quarto, just as 8o is octavo. It was uncommon to use the modern "4" shape until the later 15th century (the EVA-l character was used rather than the "4" we use now) but I have examples from the early 15th century and even some from the 14th century. And yes p'm9 is primus. JKP / for some reason on this page written 3m without "q" You are not allowed to view links. Register or Login to view. . second quarter of the 15th century. This influence is sort of a noun? In the period of the intended creation of MB used various means of identifying accounts and transformation of Indo-Arabic numerals. (Table in the first post). I want to recheck the transformation of the time numbers and habitat (territory) of their application. I would be grateful for links to scans of religious books, which recorded acts of birth (baptism) in this period. The intermediate stage of the transformation of "5". You are not allowed to view links. Register or Login to view. 1415god. But this contradicts You are not allowed to view links. Register or Login to view. 1443god. This means that either they are different schools of scribes, or the first manuscript numbering not in the time of writing. An example of strict adherence to the proportions of 5/8 throughout the book to "0" and "2". You are not allowed to view links. Register or Login to view. An example of how (in the transition period) simultaneously for different purposes use various spelling of numbers. You are not allowed to view links. Register or Login to view. 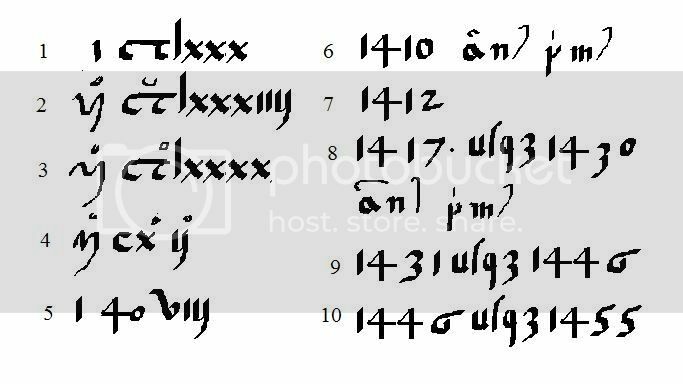 Year 1524 written by contemporary digits. And for the "2" is maintained the proportion of 5/8. (See also previous page). Sept. 17 (6 string) written by the old style. Number of enrolled students XV written in Roman numerals, and duplicated modern. (06-02-2017, 09:41 AM)Wladimir D Wrote: You are not allowed to view links. Register or Login to view. JKP / for some reason on this page written 3m without "q" You are not allowed to view links. Register or Login to view. . second quarter of the 15th century. This influence is sort of a noun? If the person's native language was French (or some other language), they might have written 3m for troisième even if the manuscript was in Latin. There's a lot of variation in spelling in those old texts. (06-02-2017, 11:16 AM)-JKP- Wrote: You are not allowed to view links. Register or Login to view. Here is an example of the numbering of the manuscript 1466 You are not allowed to view links. Register or Login to view. (208v - 210r) and its compliance with MV . To indicate the 2, 3, 4, 5 are used "tricky" ligatures. Yellow squares is highlighted separation symbol on items. The shape is similar to a computer symbol of section. PS/ Rubi N. For You impossible to send messages. See settings. Yes, we call it a "pilcrow" and I sometimes wonder if the gallows-P fulfills a similar function. There is also a "capitulum" which is a similar idea. Interestingly, historic pilcrows often look like a P and capitula often look like an H.